I was walking down Delancey some weeks ago when my eye was caught be this corner restaurant. "I know that sign," I thought to myself. I went in an inquired at Grey Lady, the restaurant in question, and sure enough: it was the classic, double-sided neon sign that hung for more than fifty years over the Famous Oyster Bar at 54th Street and Seventh Avenue, until it went out of business in January 2014. The owners had bought it and salvaged it. I think it actually looks better on the desolate corner of Delancey and Allen. As some of you have doubtless noticed, I haven't posted much lately. I have been busy working on a couple books and a variety of other activities. So, for the time being, I'm going to let Lost City rest as a sort of permanent document of what New York was, and what New York has lost in the past decade. I will occasionally post when the spirit moves me. I've put too much into the site to let it die completely. In the meantime, thanks to everyone and anyone who visits this blog and loves New York. 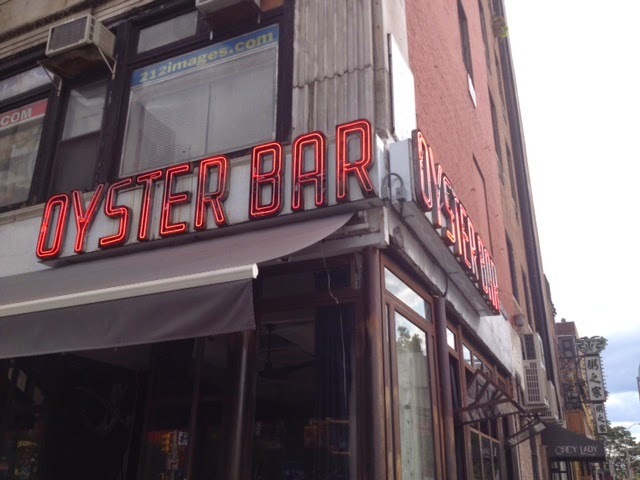 Labels: a good sign, The Famous Oyster Bar, who goes there? Was so happy to see you posting again - now, I'm sorry to see that you won't be. Please keep all of us Lost City fans apprised of your publishing activity, etc. with the occasional post or photo. For someone not native to NY, you seem to have the city right down to your marrow & those of us who've gone elsewhere love you for it. I have enjoyed the site and noticed the drop off in posts with concern. I agree with the earlier comment - please let us know of your publishing activity, and thanks for all of the great history and insights. Will miss your updates. One of my favorite features: the phone booth finds. Well, I for one will still keep checking in - from time to time at least. that you have posted over the years. Thanks for keeping the door to resumed, regular posting open (and best of luck on your book and other projects while you are on hiatus!). Lost City is one of my favorite blogs and I, too, will keep checking in. Thanks for all you've posted, with a hope that you'll keep coming back, even if infrequently, with an observation too rich to let pass. Best to you in any case. Glad you found it. And please come back soon and often. While I"m sad to see Lost City go on hiatus, I'm glad to hear that you are so busy with your rather more remunerative writing! Wishing you all the best, and thanks for keeping the site up! Your occasional future posts will be a special treat for all of your readers! I´ve been using your blog with my English students.